Holy Trinity Church is one of the architectural gems of Melbourne. It is lovingly maintained as part of the culture and heritage of this city. 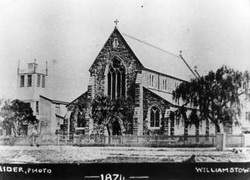 Anglican services have been held in Williamstown since 1839, originally from a store behind the Advertiser building in Nelson Place. The first Church building on the current Nelson Place site was a prefabricated iron structure, brought out from England by ship. When it arrived the plans for putting the building together were missing – making it very complicated to erect! This iron Church served this parish from 1854, although in summer it was boiling hot and in winter it was extremely cold. In 1859, the Vicar of the Day, the Revd George Wilkinson, who was a visionary, a humanist and a builder, started to make plans for the erection of a grand new Church building, designed to seat 600 people. Wilkinson’s vision came to fruition and the current bluestone Church, designed by Melbourne architect Leonard Terry, was finally built at the cost of £600. The foundation stone was laid on 11th February 1871 by Bishop Charles Perry, and the beautiful new bluestone Church building, built on the northside of the old iron construction, was finally opened on 7th October 1874. The construction process was a very significant time in the life of Williamstown, and many local families have stories of where their forebears worshipped, and how they helped create the Church building as it stands today. The building stands structurally unchanged to this day, despite needing some tender loving care. The first tenders for the construction of the current vicarage were listed in local papers in 1885, and a two-story brick building replaced the old iron one soon after. Perhaps the vicarage’s most famous occupant was Australian novelist and poet Ada Cambridge, who lived and worked in the parish during the tenure of her husband the Revd George Cross. Ada has been described as Australia’s first significant woman poet, and she lived in the vicarage from 1893 to 1910. Her book 30 years in Australia tells of her life as a Vicar’s wife, and describe their stay in Williamstown. Future plans for the site include the restoration of the Church building and the Vicarage, and the development of a new parish centre between the Church and the Vicarage, which will become a focus for the parish’s social justice and community development programs.